Payless. Bebe. The Limited. American Apparel. BCBG. hhgregg. Wet Seal. Gordmans. And those are just the stores closing in 2017 so far. If they’re not gone completely, these retailers are shutting down a large swath of their brick-and-mortar locations. 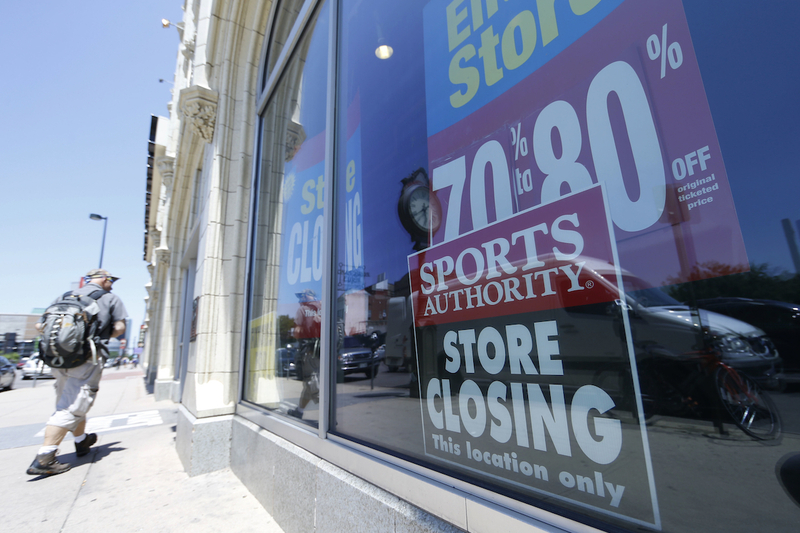 The number of year-to-date retail bankruptcies has already surpassed 2016’s. The industry hasn’t looked this bad since the recession. So that means huge going-out-of-business deals and discounts, right? One company’s loss is your personal gain, right? Hold your horses, friends. Before we get to the bargains, let’s take a moment to consider how we got here. Shopping as we know it is broken. It’s not just because we’re trading possessions for experiences. Yes, we’re spending more on travel and restaurant meals, but millennials — and pretty much everyone else — need clothes to wear and a new phone to take those cheeky vacation selfies with. It’s not just because we shop online a lot (although we do shop online a heck of a lot). The wealth of shopping options online makes it easier than ever before to compare prices, return policies and shipping costs with just a few clicks. It’s now easier to educate yourself before making a purchase. But you might be too savvy for your own good. Retailers were so desperate to get us in the door during the recession of the late 20-aughts that they trained us to never pay full price. So now, years later, you’ll wait for a BOGO or a discount (15% doesn’t cut it anymore – we want 40% off, please) or wait until something hits the sale rack three weeks after it debuts before buying. When we do pay full price, it’s for the Forever 21 jeans that only cost $10 in the first place. The stores trained us to shop like this, and now they’re struggling to survive. For every direct-to-consumer brand that pops up to sell you razor blades, makeup or leggings and ship them to your door, there’s an old-school retailer calling it quits. Bummertown. But Where are the Deals? Most of you have probably hustled to a nearby store with “Everything Must Go!” banners covering the windows. But once you’re inside, you find a wasteland of empty metal racks and messy stacks of merchandise. When you finally find something you like enough to buy, it’s inevitably available only in a size suited for a small child. Whether you’re looking for clothing, shoes or appliances, is it worth digging through the end-of-days mess to try to get a bargain? If you’re willing to try it, read these tips first. Ecommerce entrepreneur Shannon Quinn advises doing a quick check before you make a game plan to hit a liquidation sale: Does the store sell a variety of popular name brands, or is it a private label? retailers can make more money selling liquidation stock to other businesses licensed to sell those same brands. What about brands like Aeropostale, The Limited or Payless that carry their own brands? During the downsizing process, these stores can still move merchandise around from store to store to fill racks, so you might not see huge discounts. “Since they are a private label, you will see the best sales once they finally pull the plug and have nowhere left to sell their clothing,” Quinn warns. And when a retailer is on its last legs, good luck finding the size, color or model you want. Waiting for the lowest price may mean missing the boat altogether. Do you really need it? Does it really fit? “One of the fundamental issues about shopping is that if you go somewhere and you’re buying things because the price is low rather than it’s something you actually need or will use, it’s money wasted,” Underhill says. If the answer to either question is no, Underhill says to walk away. If you have a gift card for a store that’s closing, don’t hold on to it until the last minute. The Better Business Bureau told WCPO that there may not be much time between when a chain announces bankruptcy or total closure and when you find the doors locked. This is probably the one and only situation in which we’d recommend buying something just for the sake of spending. If you can’t find something for yourself, consider picking up a useful item or two to donate to your favorite nonprofit. Underhill recalls a recent trip that took him past a nearly empty American Apparel location. “I could see that 85% of the stuff was gone and the stuff that was left was 90% off. It was interesting to go in and see what other people aren’t choosing,” he says. Sometimes, that joy of gawking is also consumer education. If there’s a whole rack of one particular item or style, there’s probably a good reason hundreds of customers left it behind. Have fun trying to sort out the mystery, then move on. It’s hard to take advantage of a return policy when a store doesn’t exist anymore. Take-backsies will not apply on a liquidation deal, so be sure to try it on, test it out or ask an employee what options you have if the item breaks down the road. Yes, hearing that the superstore down the block is shutting down may stir within you the desire to hunt. But do so with caution and great skepticism. The deals may not be what they seem. Lisa Rowan is a writer and producer at the Penny Hoarder. She also co-hosts a weekly podcast about fashion and business.